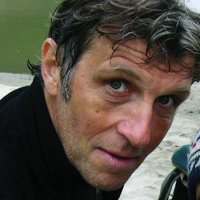 Thierry Falise is a Belgian photo-journalist who has been covering South East Asia since the late 1980s. Based in Bangkok since 1991, he has regularly contributed (text and photos) to magazines and dailies such as L'Express, Le Monde, Le Point, Paris-Match, Le Figaro Magazine, Marie-Claire, Marie France, VSD, Grands Reportages, Time, Newsweek, The New York Times, The Sunday Times and many more. He has also published three books in French, a novel ("Les petits généraux de Yadana"), the biography of Burmese opposition icon Aung San Suu Kyi ("Le jasmin ou la Lune") and a chronicle/document on the cyclone Nargis which devastated Southern Burma in 2008 ("Le châtiment des rois"). Falise has recently published a picture book, "Burmese Shadows" (McNidder & Grace, UK), on his 25 years coverage of Burma.